Last week, we talked about the symbolism of the Knot of Isis. This time, let’s talk about actually wearing the amulet. You have Your blood, O Isis. You have Your power, O Isis. You have Your magic, O Isis. It would be well to “touch up” the magical charge from time to time by repeating the Knot of Isis formula on occasion; perhaps yearly at the rising of Sothis in your area, or monthly on the full moon. 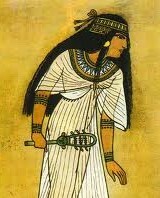 The image above is a Roman-era Isis and shows the usual way we tend to see the Knot of Isis tied into clothing. During this period, this garb was the most common way of depicting both the Goddess and Her representatives. I presume that this was considered ritual clothing and not everyday wear, but perhaps it was daily wear for full time priestesses; just a speculation. The Knot of Isis ensemble consisted of two pieces: an under-robe, long or short-sleeved, and an over-mantle that was draped around the body and tied together with a large knot—the Isis Knot—between the breasts. The mantle is often fringed. The statue above has just a little fringe, which you can see a little bit where the ends of the knot hang loose. I added the photo on the right so you can see the fringe more clearly. As you see on the left, the New Kingdom dress also has material draped over both arms and knotted between the breasts. What we don’t see here is the heavy draping under the breasts that became characteristic of the Knot of Isis costume in later periods. Our beautiful New Kingdom lady has no need of an under-robe. 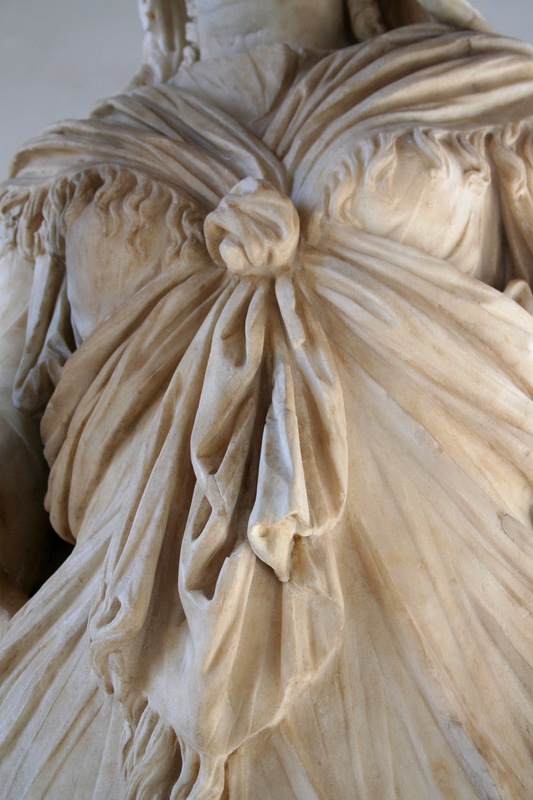 Yet Isis’ Greek and Roman devotees, in their more modest—or perhaps, restrictive—cultures, preferred an undergarment of some kind, usually a simple robe like a Greek chiton. As time passed and Egypt came under Greek and then Roman rule, Egyptian women would opt for an undergarment as well, either a slim, Egyptian kalasiris or a Greek chiton. There are some Egyptian images in which we can see the undergarment through the diaphanous draped mantle. In the Greek and Roman worlds, with the under-robe standard, the mantle could become shorter and more decorative. The fringe becomes more common and the draping, especially beneath the breasts, becomes more pronounced. 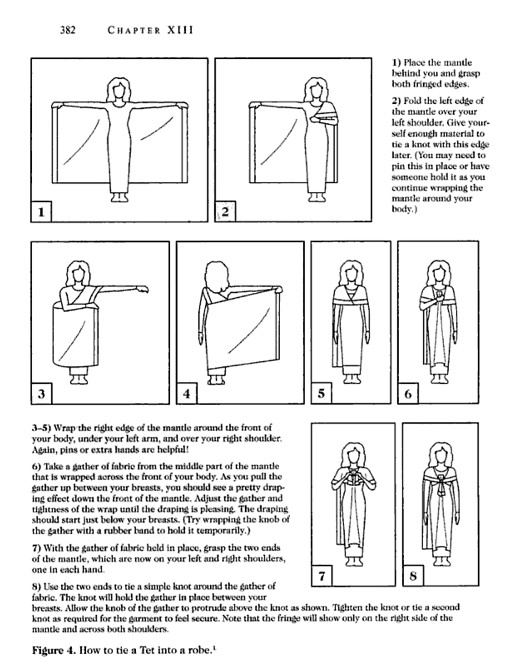 If you would like to tie your own Isis Knot into your ritual clothing, here’s the diagram from Isis Magic, reproduced for your knot-tying pleasure. Oh, by the way, be sure you use linen or some other non-slippery fabric for your mantle. My first mantle was made from a silk-like fabric and the knot slipped right off! Previous Previous post: What does the Knot of Isis mean? May I use the Roman picture on my blog please? I’m afraid I linked to it before reading your note. Okay…I see it. Yes, that’s fine! All the text on this blog is copyright by me, but not all the images. That photo, however, is my own photograph 😉 Can you send me a link to your blog? Ah, yes, I see it. That’s fine! Thanks for asking!